It was another one of those busy nights. I didn’t have time to make an elaborate meal and we are still trying to clean out our fridge. I saw I had some goat cheese and tomatos…Perfect! Goat cheese and tomato are 2 of my favorite things so I love combining them for the perfect dish. All you have to do is cut the stem end of a tomato and scoop out the inside and all of the seeds. 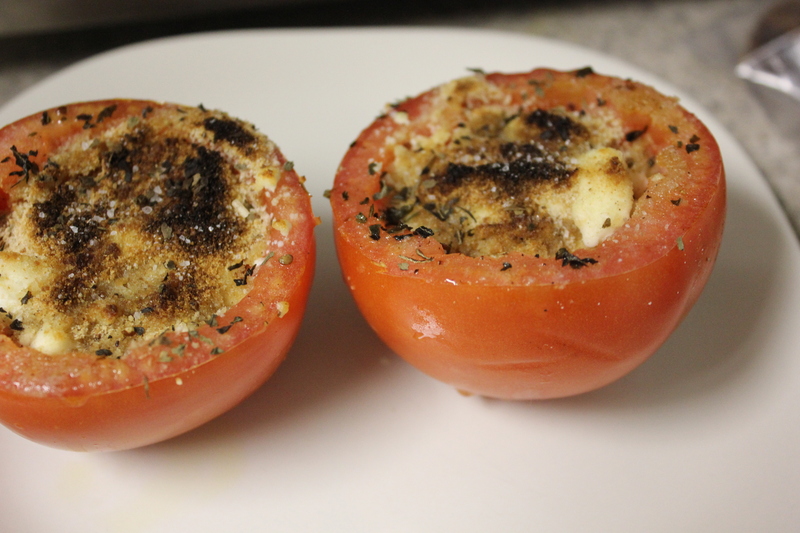 I had some crumbled goat cheese that I stuffed inside each tomato. Top each tomato with bread crumbs, pieces of torn basil, and then drizzle with olive oil. Sprinkle a little sea salt. Each tomato was baked at 375 for 3-4 minutes then I turned it up to broil for another 4 minutes to brown the top. These were delicious! I am a little biased since I think anything with goat cheese is delicious but this is definitely worth a try! Lately, my diet has been really unhealthy with the exception of the juicing that we have been doing at home. We are talking burger king 2 nights in a row unhealthy (mostly because Eric is obsessed with burger king)! 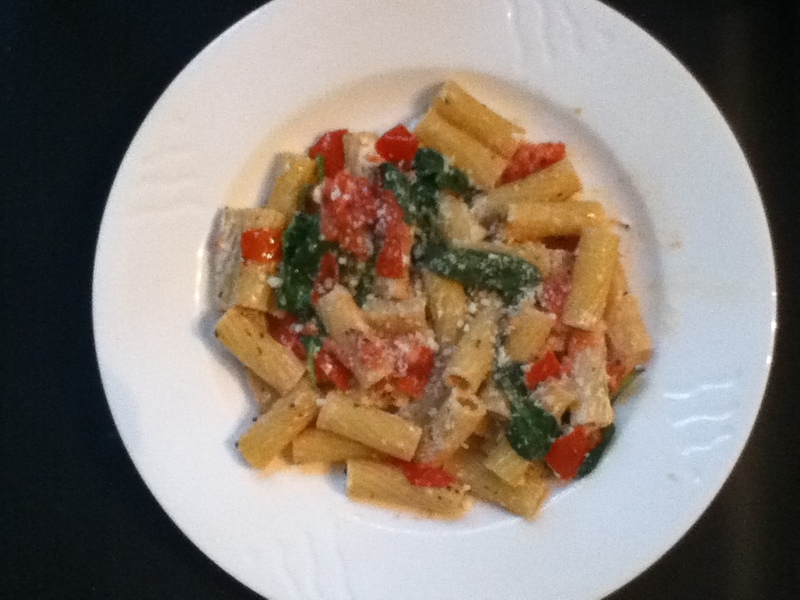 It has been really difficult to make a healthy, fulfilling, homemade meals with one hand. It also takes a lot longer to do things one-handed so I havent had time to really make anything. I know that I could always ask Eric to make something, but I like playing with recipes and making it up as I go along so it’s hard to do that through Eric. Last night, I decided that there are still ways to eat healthy, with a few adjustments to make it easier. 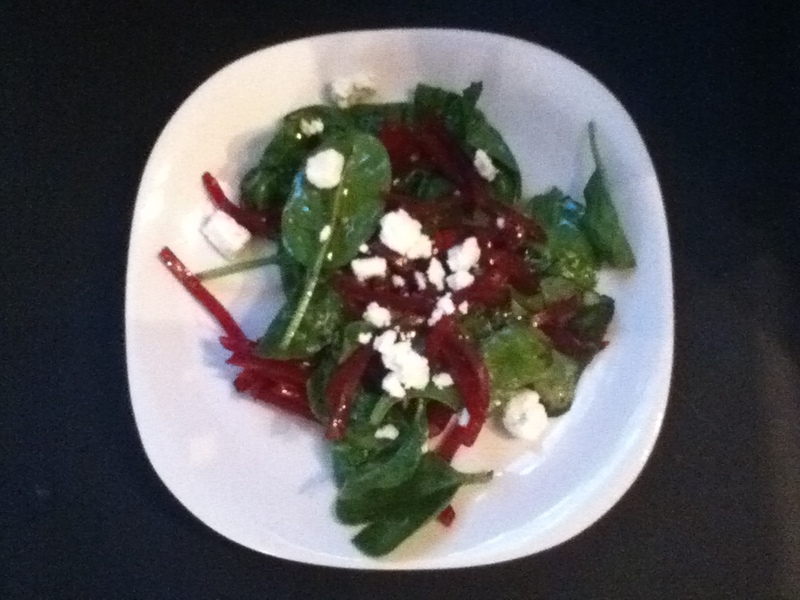 A friend of mine (thanks Alexis) shared a yummy beet salad recipe with me (this is not the exact recipe but like I said I play with recipes based on what I have already). I absolutely loveee beets. Usually it calls for using fresh beets, cooking them, and the slicing into whatever shape you like (I like string-like thin slices). While at the grocery store, I found shoe-string beets in a can. Perfect this would eliminate the whole cooking and chopping of fresh beets. I had some spinach that we usually use for juicing. So I tossed those together, bought a container of crumbled goat cheese to add on top, and mixed together a light dressing. The dressing consisted of white balsamic vinegar (it tends to me lighter in flavor and less messy to work with since there is no color staining), olive oil, salt, pepper, and garlic powder. Finally, a healthy meal!!! And I was able to do it all with one hand. It was delicious and I had it with a carrot, broccoli, apply juice concoction we made up based on what was in the fridge. It doesn’t sound that tasty and definitely did look great but the taste was pleasantly surprising. I really enjoyed it and finished my glass in a few gulps. Hopefully I am now inspired to make other easy healthy meals!